So, have you made some plans for Mothers Day yet? Planning to make dear old Mom breakfast in bed, rub her feet, sing her a tune or two? Boy, that’s really nice of you. I bet she will love it. Perhaps you are meeting with extended family members or friends to celebrate over a lovely brunch. If that’s the case, please notice that under my header I have categorized my best Spring Brunch recipes all together in one place. You can also access it by clicking here. 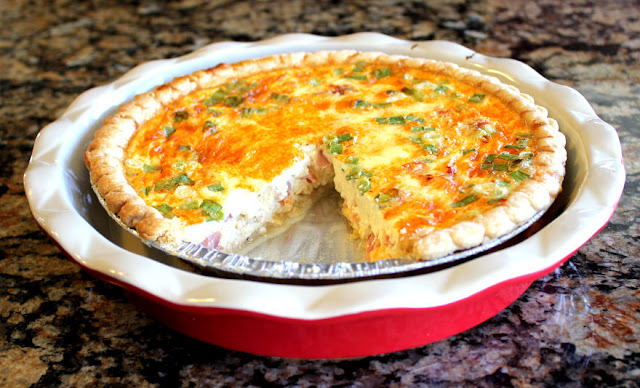 This simple Ham and Quiche would make a great addition to your Mothers Day breakfast or brunch menu. It comes together easily with very little prep time needed (if you buy a pre-made pastry crust, that is.) It’s flavorful, hearty and is made with simple ingredients. I love it. I bet your Mom will love it. I bet your Mom’s Mom and your Cousins Uncle will love it, too. ***NOTE:For this recipe I used a pre-made, purchased, I am not a pioneer, sometimes I need to save time, pastry crust. If you would like to make your own, I hope you will! My hats are off to ya. You can find a great recipe by clicking here. 1. Preheat your oven to 425 degrees. Crack 4 eggs into a medium sized mixing bowl. Beat them well with a fork. a 1/4 teaspoon salt, 1/4 teaspoon pepper and 1/4 teaspoon smoked paprika. Stir all of the ingredients together well. I like to use a fork. 3. If you are using a pre-made pie crust, it’s a good idea to put it (baking tin and all) inside a pie plate. That way if the filling comes over the edge a bit, you won’t have a mess on the floor. Place 1 cup shredded cheddar cheese in the bottom of your unbaked pie crust. 4. Chop up 1/3 of a cup of green onions and sprinkle them over the cheese. 5. Add 3/4 cup diced ham. 6. Pour the egg/cream mixture over the top of the ham. 7. Carefully, oh so carefully place it in a oven and bake it at 425 degrees for 20 minutes. 8. Reduce the heat to 325 degrees and cook it for another 45 minutes. 9. Let the quiche rest for about 5 minutes before cutting into it. Oh yummm! It looks so easy. I'll have to give it a try! My husband can be a picky eater and I was surprised he even tried the recipe and he likes it! My dad LOVES it and wants the leftovers for his supper tonight. Great recipe and so easy to make. could I sub regular paprika for the smoked? Yes, that substitution would work out well. Best of luck to you! Any tips on reheating this? I’m making it for Easter, but the night before. Love your recipes but like to know where to find the nutritional info of each recipe.